When your light bulbs die, don’t throw them out. Make them into really cute ornaments. My favorite one is the Snowman Light Bulb. Hang & enjoy! Great craft with kids, although I suggest doing the painting beforehand, since it takes a bit of time. Nice thought, but I’d think twice before giving children glass lightbulbs without very careful supervision – depending on their ages, of course. 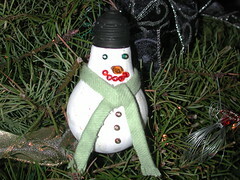 My friend gave me a lightbulb snowman many, many years ago. She coated it with textured paint and it has stood up to my cat knocking the tree down several times, breaking all ornaments but that one. I’ve kicked it several times on accident across the floor, it’s dropped out of my hand many times and I’ve dropped the box getting it out of the attic every year. I’m a clutz and it’s the perfect ornament. its awsome I think you should make the snowmans and sell them you could make a fortune! It realy is a good idea my mom agrees!She says”Its child friendly as long as im under her super vision”.So what I think is keep the crafts coming we have now a new addition to the Christmas trees.Happy holidays and remimber Santa is watching!!! Thanks so much! I think I’ll start making more of these for gifts since everyone seems to just love the one I made for myself. I have several lightbulb patterns and pictures plus the titles of a couple of books on bulbs. That is very creative. I like that I think I’ll try it some time. Quite costy though, since its Radko.